Yes, I am aware that I said that I would only have two more feature for NH Prof before releasing. But I am currently being held hostage by the new features fairy, and negotiations over a feature freeze seems to have gotten to a stand still. Beside, it is a neat feature. As you can see, we are actually setting the BlogId to the same value, twice. 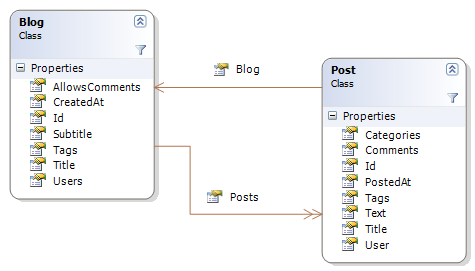 Now, there is a very easy fix for this issue, all you have to do is to tell NHibernate on the Blog’s Posts mapping that this is a collection where the responsibility for actually updating the column value is on the other side. This is also something that I tend to check in code reviews quite often. The fix is literally just specifying inverse=’true’ on the <many-to-one> association. Great feature! I love the direction this is taking, and that NHProf can start to actually teach people useful information about NHibernate. That also gives them 2 reasons to buy your product - to help find possible performance problems and also to learn how to resolve them. I really like the alerts NHProf is getting. So far, profiling (such as JetBrains dotTrace or RedGate ants) usually 'pauses' the moment the application (or depended component) performs a database query. All we know is that DbCommand.ExecuteQuery took 120ms. We offen tent to try to minimize those performance bumps. Because we are confidant that our queries are very optimized, that those areas are usually skipped during profiling sessions. Most developers use tools like Microsoft query analyzer to see if they have made the proper indexes. Because the update is unnecessary, such a alert can be a (literally) real time safer when you're dealing with a customer <--> order association where both tables have more than 10 million records. In today's applications databases play an important part. Compared to the profilers mentioned above 200 (or less) euros for a query profiler/debugger/optimizer is a very good bargain. A must have for every .net developer! "The fix is literally just specifying inverse=’true’ on the <many-to-one association." This is the correct side right? I think of this as the one-to-many side but I may have just misinterpreted my definitions :). Does this profiler work with the Java version of Hibernate? There is a high likelyhood that it would,as a matter of fact.